Skeptics will often criticize Christians for “cherry picking” passages from the Bible to obey that they like while ignoring the difficult passages or morally questionable one. “Why do you accept the passages that condemn homosexuality but still eat pork?” In this article series I will not be addressing that claim directly (though I have elsewhere), but will be showing that to a large degree other criticisms of the Bible made by atheists frequently rely on their own cherry picking and a heavy handed treatment of Biblical passages or Ancient Near Eastern (ANE) history and often a total ignorance of original languages. In particular I will be responding to the oft declared critique that the Bible condones slavery. Before I start I should note that the purpose of this series is not to endorse or even defend some version of the doctrine of inerrancy. I will not be attempting to argue that the Jews (as a unified people) were oppressed in Egypt for 400 years, were miraculously spared by the hand of God, brought out of Egypt in a mass exodus, received the Torah from the hand of God at Sinai or any other such events. I am not going to be arguing for a earlier or later date for the composition of the texts or even that the texts have been handed down reliably to us through history. While I think that all of these can be reasonably argued for and defended (and again have done so elsewhere) the purpose of this article is merely to elucidate what it is that the Biblical authors, in their historical contexts, were and were not commending or condoning within the Biblical texts as we have them today. It is because I know that many objections will come in this kind of form of diversion that I wanted to state from the outset that my intention is not to argue for or support any of these kinds of positions. We will begin by exploring the ANE slave cultures, including that of Israel, as compared the New World African slavery and then move into handling the specific casuistic laws in the Old Testament regarding the legal restraints on slavery, slaves, and masters. Due to the fact that this kind of atheistic objection will often quickly migrate to blaming New World Slavery on Christianity and the Bible, I will end by showing that had the West actually followed the Law found in the Old Testament they would have categorically been opposed to the kind of slavery we saw in the African slave trade. There is actually a somewhat apt parallel in the Colonial west to what we find in Old Testament Israel but it is not the African Slave trade. The “slavery” that we find in the Bible is much more in line with indentured servitude of colonists unable to pay their way to the colonies. In order for pay fare, a hopeful colonist would attach themselves to a wealthy business owner or family to work for them to repay the debt of the fare. They would work in their households or in their businesses as apprentices (the equivalent of modern Trade Schools) until their debt was paid and then they were free to go. It is estimated that nearly one half to two thirds of all colonists arrived as indentured servants in some capacity. There were, no doubt, abuses of this system with dishonest businessmen making the ability to pay off the debt nearly impossible, but that itself is not an indictment on the system itself but rather the ability to regulate the system. 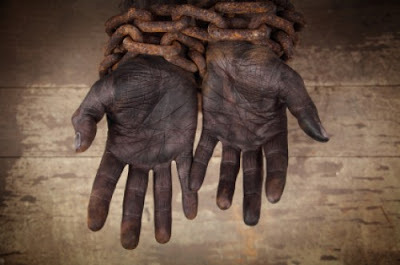 As we will see this is a much more adequate parallel to “slavery” in the Old Testament, which should be considered more inline with debt servitude than with slavery. This is because, as we will see, the overwhelming majority of the texts relating to slavery were either directly or indirectly related to paying off some kind of debt. In the Old Testament the term commonly translated as “master” is ’adon (אדנ). Translating this as “master” is however far too strong a rendition of it in many places. It is used to refer to the relationship of a father over his son, a husband over his wife, a ruler over his kingdom, an owner of his land, a manager over his hired employees, and a master over her his servants. To treat this as if it categorically refers to the a kind of repressive despotism as described by Stowe is shallow indeed. We see this even further when we look at the term commonly translated as “slave” in the Old Testament, ‘bed (עבד). This term can refer to a slave, but it can refer to a son, a daughter, a spouse, a hired employee, a prophet/priest, a king, and to Israel itself. The reference seems to be to one who serves in some capacity and not to someone who is completely owned against their will to the cruel treatment of another. Paul Copan points out that even when the Bible uses terms like “buy,” “sell” or “acquire” it still does not refer to a person being, body and soul, property of their “master.” In fact we still use this kind of language today. Think of a professional athlete who is bought under contract by the “owners” of the team, who can be traded at any time and who cannot freely violate their contract without heavy personal and financial cost to themselves. Now let us move on to looking at the role that debt servitude played in ancient Israel. This is pivotal to grasp before understanding the meaning and purpose behind specific casuistic laws regarding the rights of debt servants and their owners found elsewhere in the law. In ancient times there were no banks. There were no debt consolidation firms, no bankruptcy laws, no lines of credit, no job hunters for new careers, no diversification of labor. When a person owed another person, they settled directly with that individual. This was also a communal society. This meant that debt did not come to individuals – it came to whole families. If the father made poor business decisions, the entire family suffered. They did not each have their own social security number with their own credit history. When a father gained serious indebtedness he could either let his family lose their land and starve, or give the only collateral he had left at his disposal – himself and his family. As strange as it might sound, in many ways debt servanthood was a protection from starvation for many in the ancient world. Unlike New World slavery, debt servants were not kid napped or forced to serve against their will. They would voluntarily offer themselves and their families as collateral against their debt – “one of your countrymen becomes poor and sells himself” (Lev. 25:47). If they failed to pay their debt they would then go in service to the person who they owed. In return they would be able to work off their debt. This would frequently entail them being able to stay living in their own land, their own homes, work their own crops, etc. simply in service now to the owner rather than unto themselves. There was also the option that his kin could ransom/redeem him (i.e. pay off his debt) and thus fulfill the debt requirements, or else he would be required to work a maximum of 6 years until the Sabbath year when debts were to be cancelled (although his land would frequently stay mortgaged until the year of Jubilee – a maximum of 49 years if his family could not redeem it sooner). 14 ‘Every seventh year each of you must free any fellow Hebrews who have sold themselves to you. After they have served you six years, you must let them go free.’ Your ancestors, however, did not listen to me or pay attention to me. 15 Recently you repented and did what is right in my sight: Each of you proclaimed freedom to your own people. You even made a covenant before me in the house that bears my Name. 16 But now you have turned around and profaned my name; each of you has taken back the male and female slaves you had set free to go where they wished. You have forced them to become your slaves again. God then goes on to state that their refusal to keep the law regarding the freeing of debt servants is the primary reason for the future exile of the people into Babylon. As we will see, what we find more often than not is that God’s law is much more concerned with the freeing of servants than the acquisition of them. This is because, as we will see, is that God’s expressed will for Israel was that “…there need be no poor people among you, for in the land the Lord your God is giving you to possess as your inheritance, he will richly bless you, 5 if only you fully obey the Lord your God and are careful to follow all these commands I am giving you today” (Deut. 15:4-5). If servanthood in Israel was primarily the result of poverty, but God’s desire and law were geared to eradicate poverty in Israel, then it is quite clear that God’s goal was also eradicate servanthood in Israel. So if this was God’s intention, then why not simply outlaw it like he does wearing clothes that blended two fabrics or the eating of pork? When we compare servanthood in Ancient Israel with that of slavery in other ANE cultures we see four distinct differences. Firstly, in Israel, contrary to what skeptics assert (and I will show this when we get to the specific laws) servants were not chattel. That is, they were not rightless property at the disposal of the master to do with as he desires – including to treat harshly and brutishly. Secondly, the rights of the owner over the servant were not absolute in Israel. They did not have the right over “body and soul” as Stowe described New World masters and which was true in all other ANE societies. Thirdly, the servant in Israel kept his name, family, and social identity. This was not the case in other ANE nations and in New World slavery where the slave often has his name changed, was separated from their family, and lost all social status or identity. Finally, we see that the allowance of debt servanthood in Israel was for the protection of the poor. We will discuss the difference of approving and allowance shortly, but for this point we can see that this was not only used to allow families to pay off debt in a relatively short period of time (6 years maximum as opposed to lifelong slavery) but also that God set in place laws that not only required the freeing of servants during the Sabbath years, but also the provision for the poor to keep them from becoming indebted and for servants being freed. The Mosaic legislation had certain laws in place that required the people to do what they could to keep the poor from falling into starvation or total indebtedness. One such law is found in Lev. 19:9-10, 23:22 and Deut24:20-21 where Israelites were to not harvest for themselves from the corners of their fields so that the poor could glean them for themselves. That is, it required that the edges of a person’s farm/vineyard were to be cultivated but left unharvested so that the poor could come and harvest it for themselves! In addition to this Israelites were commanded to lend to their fellow Israelites freely, that is, without charging any interest (Ex. 22:25; Lev. 25:36-37) and that if the poor could not afford the more expensive sacrifices of bulls and goats and lambs, they were permitted to sacrifice much less costly sacrifices such as doves (Lev 5:7, 11). To go even further, when a servant was finally freed (either after paying off their debt or because a Sabbath year had arrived) the owner was not simply to set them free, but they were to generously provide for them without a “grudging heart” (Deut. 15:10). This was simply unheard of in the ANE and in the antebellum south. While some ANE cultures did have examples of mass debt cancellation, it was extremely sporadic and was usually only at times when a new ruler came to power. In addition the debt that was cancelled was the debt to the king and not all debt of all servants. At this point I would like to urge you to go and read Deuteronomy 15:1-18 that is the Old Testament enunciation of the desire of God to eradicate poverty, and thus debt servanthood in all of Israel. However, because we live in the real world, and people are, let us say, less than perfect, there would also assuredly be poverty, even though God had set up clear laws toward its abolition. Because of this, the Mosaic law sets out laws, not to endorse or idealize servanthood, but to control and regulate it to minimize and humanize it and to set the precedent that it was less than God’s ideal. In fact we see an example of this in Jesus’ comments on divorce in the New Testament. In Matthew 19:8 Jesus says that God allowed divorce in the Old Testament, not to idealize it or endorse it, but “because of your hardness of heart.” That is, that God created a divorce law, not because He endorsed divorce and the destruction of the family unit, but because he knew human nature and knew that even if outlawed it, due to social pressures people would do it anyway and so he wanted to set up certain protections for the women (the certificate of divorce in the Old Testament maintained the woman’s social status and allowed her to return to her home without being disgraced as shameful or sinful). So too with the laws regarding servanthood in the Mosaic Law, God established laws that would protect those involved and set up other mitigating statutes that would diminish the volume of debtors in the land. The faithful Jew would see in the law that God cared for the poor and the servant and thus so should they. This expressly states that God has made both the rich and the poor, the owner and the servant, and that God will side with the servant if the owner has treated him unjustly. He knows that if he has denied justice to his servants or if he had treated them in such a way that they had a valid grievance against him, that God would be on their side. God would be their advocate and uphold their rights. This was a sentiment entirely lacking in every other ANE culture and definitely missing in the New World African slave trade. In the next article in this series we will begin to explore the specific passages in the Mosaic law dealing with servanthood and explore exactly what it was like to be a servant in Israel and if the laws are the means of violence and oppression that the critics make them out to be. [i] Here I would like to simply note in passing the numerous problems of basing an objection to theism based on objective moral facts. The skeptic, basing his views on his naturalistic worldview, is on dubious ground to say the least on this point. The enslavement of Hebrews was in most ways and cases more comparable to modern notions of indentured servanthood than of slavery. This is pretty clear from even a very cursory pass at OT slavery passages. The relevant criticisms, however, rely primarily on passages describing the acquisition and treatment of foreign slaves. Some of these passages, at least in English translations, refer explicitly to permanent and inheritable slavery. Verses dealing with foreign slaves take care to distinguish this slavery from the form applicable to Hebrews; it seems that this is categorically different and deserves mention as such, not as merely specific cases that fall within the system you described in this part. Do you intend to address the verses prescribing this sort of slavery?